Terrorists fail to seriously injure due to quick-thinking IDF soldiers. Three terrorist attacks took place in the Hebron region over the weekend. On Friday, two terrorists in a car tried to run people over at the Elias Junction near Kiryat Arba, Hebron's sister city. The male driver and female passenger were stopped by quick-thinking Israel Defense Force soldiers. The female passenger was the sister of a female terrorist who tried to commit a car ramming attack at the same location in June. They were residents of nearby Bani Na’im, which has been the base of much terrorist activity. Later in Hebron, an Israeli soldier was stabbed and wounded by a terrorist who was quickly eliminated. On Saturday, a second terrorist stabber attacked a soldier in the Tel Hevron neighborhood near the archaeological park. A video depicts the terrorist approaching the soldier with identification papers and then pulling out a knife and stabbing him. The terrorist was quickly tackled by other soldiers and neutralized. The stabbed soldier suffered wounds to the face. What is Israel facing when it comes to terrorism? A newly released video shows the moments in which a Palestinian assailant attacked Israeli soldiers with a knife in Hebron Saturday morning, lightly wounding one of them before being shot and killed. 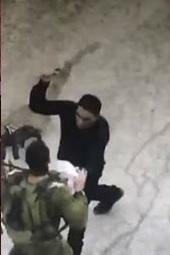 The attacker, identified as Hatem Abdel-Hafiz al-Shaloudi, is seen approaching a soldier at a checkpoint near the West Bank city’s Jewish Tel Rumeida neighborhood and presenting him with a piece of paper, ostensibly his credentials. The moment the soldier accepts the paper and glances down at it, Shaloudi is seen pulling out a knife and lunging at him. Also over the weekend, a terrorist with a knife was eliminated in front of the Shchem gate in Jerusalem's Old City on Shabbat. On Friday, an Egged bus driver was injured when large stones and paint bottles were thrown at the bus as it traveled from Jerusalem to Maale Adumim. On Sunday, a terrorist stabbed an IDF soldier in Efrat. The Jewish Community of Hebron thanks the brave soldiers of the IDF who stand guard protecting the lives of both the local community and the 700,000 people who visit every year. In addition, the IDF presence and the normalized civilian community ensures that the terrorist infrastructure does not leak out into the rest of Israel.